Already a member? Renew here. This is the information you'll need to login to your online account and renew your pets' licenses in the future. I have read and accept the DocuPet Terms of Service. It's important to keep your contact information accurate. If somebody finds your pet, this is how we'll get in touch! Enter your pet's primary home address. It's important this address is accurate and always up to date in the event that your pet ever becomes lost. 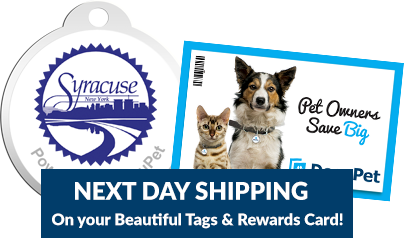 Your mailing address is where we send your tags and rewards cards. If this is different from your licensing address, uncheck the box and enter the address. My mailing address is the same as my licensing address. Enter your pets' information here. Click "Add Pet" to add an additional pet; click "Remove Pet" if you've accidentally added one too many. Veterinarian Camillus Animal Clinic Cicero Animal Clinic CNY SPCA Dewitt Animal Hospital Dewitt Veterinary Medical Center Fairmount Animal Hospital Liverpool Animal Health Center Liverpool Village Animal Hospital Lyncourt Veterinary Hospital Mattydale Animal Hospital Nottingham Pet Clinic Onondaga County Health Department Quarryside Animal Hospital Rockacres Veterinary Hospital Shamrock Animal Fund Shop City Animal Hospital Spay & Neuter Syracuse Stack Hospital for Pets Stack Veterinary Hospital Town and Country Hospital for Pets VCA Shop City Animal Hospital Vetco Vetco Clinic Veterinary Medical Center of CNY Village Veterinary Hospital, P.C. I verify that my pet's information contained within this form is correct and my pet's vaccines are up to date.